DRIVING along the Hume Highway, motorists encounter billboards designed to save their lives. But now, among the road safety messages, is a new billboard that champions the right to die. And the placing of the initial billboard is quite appropriate, given Yagoona hosts a plethora of multicultural voices, mostly from vote-deprived and un-democratic nations,who are easily manipulated and where death is seen as more of a spiritual affair and less about morals and rights. 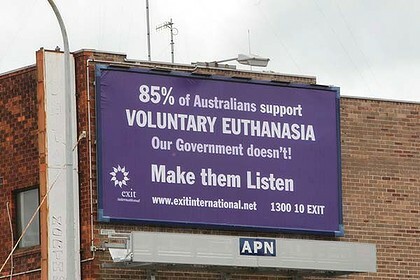 More billboards are proposed, and the director of Exit International, Philip Nitschke, is considering using similar wording in redrafted television advertisements after a more emotive commercial was cancelled two days before it was due to screen. Advertisers had feared the TV ad breached laws against aiding or abetting suicide or attempted suicide. Billboards Australia baulked at the Hume Highway ad for the same reason but eventually agreed there was no legal impediment.